Thursday evening, August 8, marked a high point in Skip Flanagan's life. In a pre-game ceremony, he received the 2013 Adam Keenan Sportsmanship and Scholarship Award from FCBL, in conjunction with the Old Orchard Beach (Maine) Raging Tide. He is the third player to receive this award. Adam Keenan was a University of Massachusetts-Lowell student majoring in Criminal Justice. He was also a passionate baseball player, with the UMass Lowell Riverhawks and the Seacoast Maverickls of the summer Futures Collegiate Baseball League (FCBL). On June 6, 2011, just after the Mavericks had a light workout in Rochester, New Hampshire, to start off the season, Keenan collapsed on the field and died of cardiac arrest. He was 20. Although he was known to have a heart condition, no one realized that he had an extremely rare one (Arrthythmic Right Ventricular Cardiomyopathy). His family, teammates, and friends were stunned and devastated. Several memorials have been set up to honor his memory. The FCBL established the Adam Keenan Sportsmanship and Scholarship Award shortly after his death. Each year, FCBL selects a player who exemplifies Keenan's commitment to the game, integrity, and conduct on and off the field. Sean Flangan, nicknamed Skip, was born deaf, and his parents, Susan and Sean, discovered this when he was 17 months old. They promptly bought an ASL book. Young Sean's first sign was “ball,” and his second was “home run.” He grew up in Framingham, Massachusetts, and attended The Learning Center, an EDCOl program at F. A. Day Middle School, and his parents' alma mater, Bishop Feehan High School in Attleboro, where he put in two fine seasons of varsity baseball and one of track. According to Kyle Lawless, he “inspired several of his classmates to pursue careers as sign-language interpreters.”* An honor student, he had an interpreter, but was treated just like any other student. He tells us that he “had a blast” there. After	graduating in 2011, he entered RIT, where he's a junior majoring in Psychology (Dean's List). On RIT's Tigers, he plays first base and the outfield. He enjoyed a breakout season this past year, setting two single-season records: 150 at-bats and 364 putouts. He was an American Baseball Coaches of America (ABCA)/Rawlings All-New York Region third team and All-Liberty League Honorable Mention. 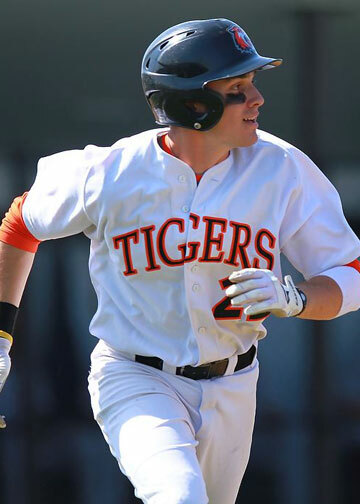 As a sophomore, according to Joe Venniro, Director of Sports Information, he “led the team with 53 hits, third most in one season at RIT, 12 doubles, fourth most in a single season, and 35 RBI’s, sixth best in a season. Flanagan also recorded a team-best 69 total bases, while scoring 28 runs and stealing nine bases, both second most on the squad. “Flanagan drove in a career-high six runs on a pair of occasions during the 2013 season, first on Feb. 27 in a win over SUNY Canton, then on April 28 in a 20-0 win over Liberty League foe Vassar. He was a model of consistency during the season, recording a hit in 31 of 39 games, with 17 multiple-hit efforts. Flanagan ended the year with a double in five straight games and in the season finale against Houghton, ripped a career-high four hits in a 15-1 win. One of his ambitions is to attend graduate school; a long-range ambition is to open a baseball-training complex.